China Championship 2018 – Mark Selby is your Champion! Mark Selby won an incredibly tense final, beating John Higgins by 10-9. Both players were far from their absolute best, but both battled incredibly hard, giving it all and more. For most of the match John Higgins had looked the slightly better player, but Mark Selby potted some crucial balls under the highest of pressure and that made the difference in the end. It was a great match, not so much in terms of quality maybe, but in terms of intensity certainly. Tomorrow, in Guangzhou, the final will be Mark Selby v John Higgins, as both experienced and prolific tournament winners got the better of their young talented opponents. The table had been recovered and played much faster than it had all week. John Higgins played much better in those conditions, closer to what he’s used to than the heavy/sticky conditions that he faced earlier in the week. Lyu Haotian on the contrary was really struggling with the pace of the table and for most of the match couldn’t get control over the cue ball. It’s only towards the end of the match, far too late, that the young Chinese was able to settle a bit and do his talent some justice. That said, John Higgins was still not at his best. 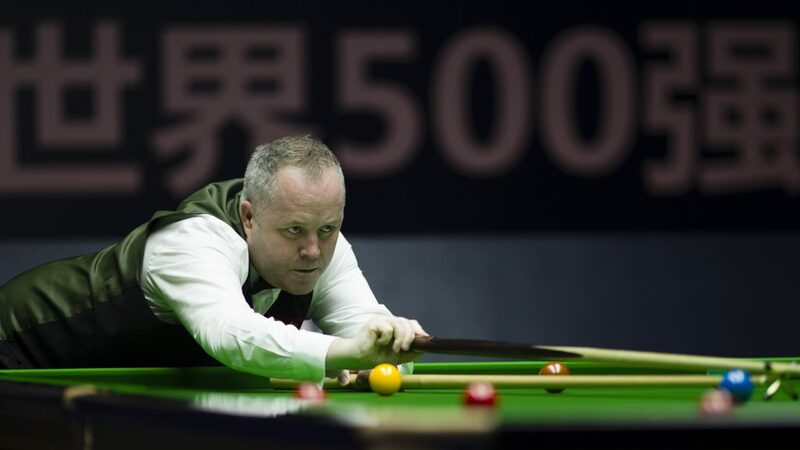 John Higgins reached the final of the Evergrande China Championship by beating Lyu Haotian 6-3 in Guangzhou. Scotland’s 43-year-old Higgins will face Mark Selby or Zhao Xintong in Sunday’s final, with the winner to bank £150,000. Higgins will be playing in the 49th ranking final of his career and aiming for his 31st title. His most recent came at the Welsh Open in March. World number four Higgins has been far from his best this week, failing to make a century in the tournament so far. But his matchplay skills and gritty determination have carried him all the way to the final. He built a 5-1 lead today with top breaks of 57, 57 and 59. 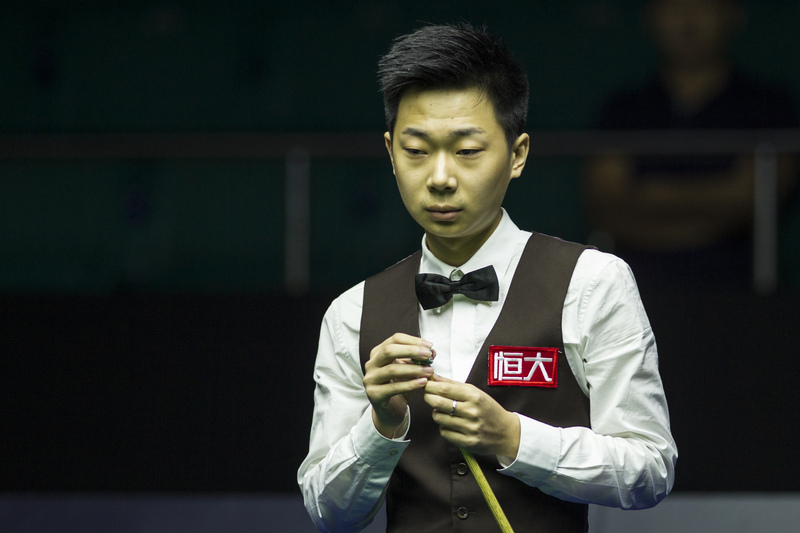 China’s 20-year-old Lyu, who had hoped to reach his first ranking final, pulled two frames back, before Higgins sealed the result with a run of 62 in the ninth. ”The conditions today were beautiful, having been difficult earlier in the week,” said Higgins. “That threw Lyu just a bit more than me, he was hitting everything thick because the table was so reactive. “If Lyu had played today the same way he did in the quarter-finals I would have been in for a really tough game. But luckily for me he wasn’t at his best and I just picked up the pieces. I don’t know how I’m in the final but obviously I’m delighted. Mark Selby played well from the start in his semi finals, whilst Zhao Xintong needed more time to settle. Mark Selby lead 4-1, before being pegged back at 4-4 and 42-42 in the 9th frame. This seems to be a pattern with Zhao: Mark Williams was 3-1 up at the MSI before losing 5-3 and Barry Hawkins lead 3-1 and 4-2, before losing 5-4. But this time it wasn’t to be for Zhao as the World n°1 stopped the rot and finished the job 6-4. 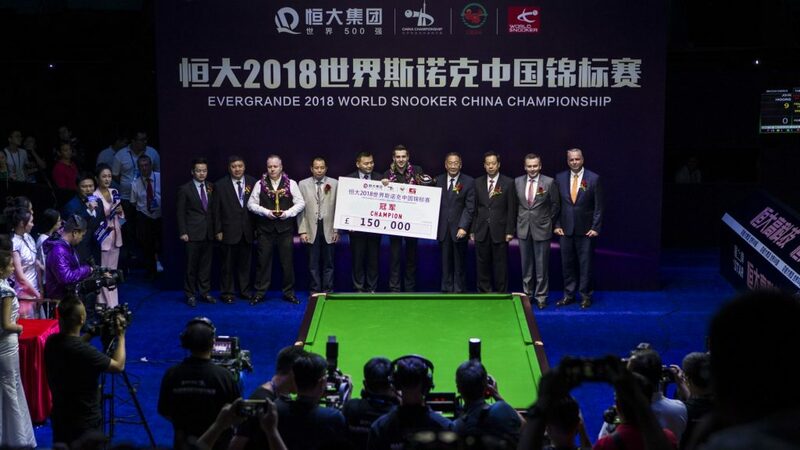 Mark Selby ended the giant-killing run of Zhao Xintong to reach the final of the Evergrande China Championship with a 6-4 victory. 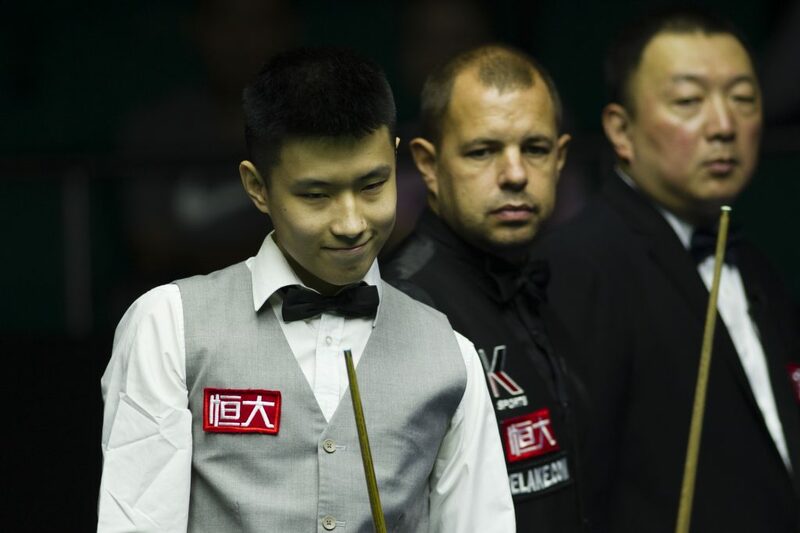 China’s 21-year-old Zhao had knocked out the likes of Mark Williams and Barry Hawkins to reach his first ranking semi final, and he looked in with a chance of continuing his run when he came from 4-1 down to 4-4 against Selby. But experience paid off for world number one Selby as he took the last two frames. The Leicester cueman will face John Higgins in Sunday’s final, with the winner to earn £150,000. 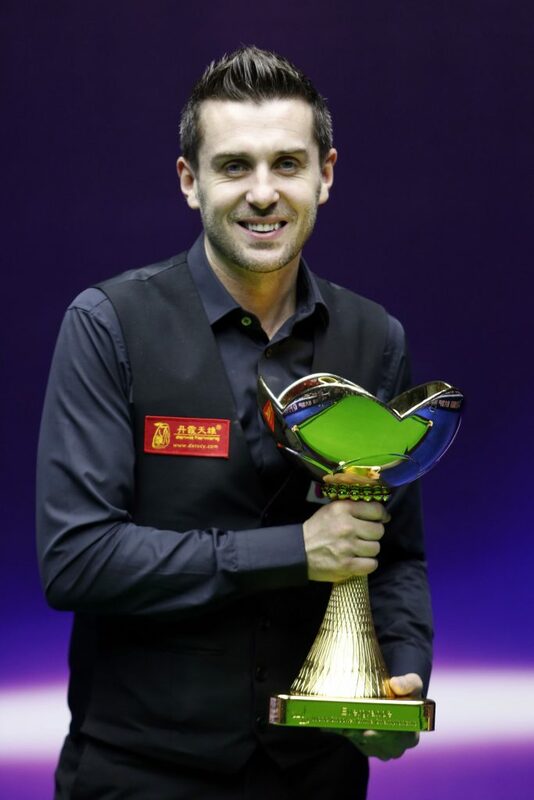 Selby is chasing his 15th career ranking title, and victory in the final would give him a fifth ranking crown in China within the past two years. Tomorrow’s clash will be a repeat of the World Championship finals of 2007 (won by Higgins) and 2017 (won by Selby). Breaks of 90 and 82 helped Selby build a 4-1 lead today. Zhao made a 110 in getting back to 4-4, but Selby crucially took a scrappy ninth frame then sealed victory in the next with a run of 63. ”I played well for most of the match, then I missed a red to a centre pocket at 4-1 and the match turned,” said Selby after reaching his 24th ranking final. “Zhao put me under pressure and played some good safety. If both play like they did today, Mark Selby should win tomorrow. Mark however was looking tired at times, and previously admitted that he didn’t sleep well. Today he made some uncharacteristic mistakes, including touching a red with his cue whilst trying to judge angles for his next shot. Best of 19 over two sessions is quite demanding and fatigue, if any, could become a decisive factor. So we have two established top players from Britain against two very young up and coming players from China in the semi finals tomorrow. 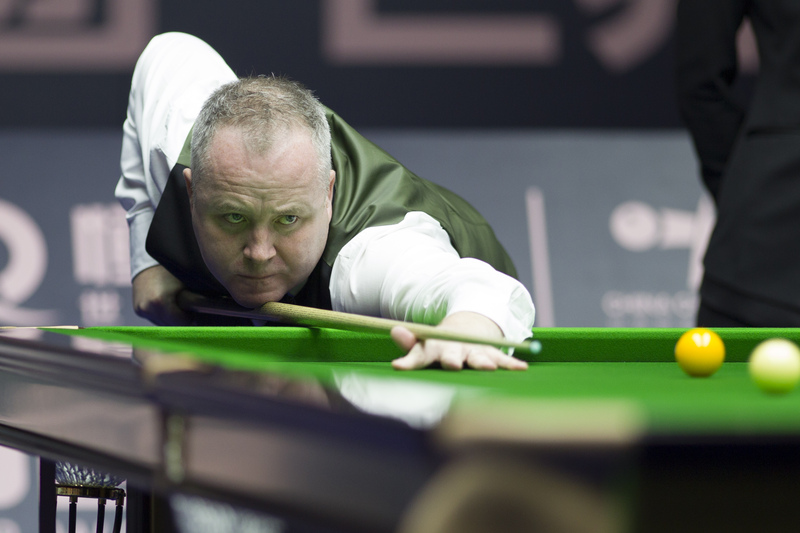 John Higgins continued his recent hoodoo over Judd Trump by winning 5-3 to reach the semi-finals of the Evergrande China Championship. On Saturday Higgins will meet China’s 20-year-old Lyu Haotian, who beast Martin O’Donnell 5-1. The winner will go through to Sunday’s final in Guangzhou to compete for the £150,000 top prize. Scotland’s Higgins has won his last four matches against Englishman Trump, including a 13-12 thriller at the World Championship earlier this year. World number five Trump had played the best snooker of the week so far, losing just three frames in his first three matches, but struggled to produce the same standard today. He led 3-2 with top breaks of 55 and 50 but Higgins cleared from blue to black to win frame six then made a 79 to lead 4-3. In frame eight, Trump had a chance to clear from 45-0 down but failed to get position on the final yellow. It came down to the pink and black and when Trump missed a long pink he left his opponent to pot both balls for victory. “The standard was atrocious,” admitted Higgins, seeking his 31st ranking title. “Judd and I usually have decent games but that was pathetic. I’m struggling and bringing people down to my level. I don’t know how I am in the semi-finals. Judd will be kicking himself because I was hopeless. Lyu reached the semi-finals of a ranking event for the second time in his career – his previous run to the last four came at last season’s Northern Ireland Open when he lost to Yan Bingtao. World number 58 Lyu sailed into a 3-0 lead today with breaks of 102, 57 and 124. O’Donnell pulled one back 93 but his opponent took the next two frames on the colours to seal the result. “I played well, especially in the first half of the match,” said Lyu, who dropped off the pro tour in 2017 but regained his place and climbed into the top 64 last season. “After the mid-session interval we both missed a couple of easy shots. Chinese prodigy Zhao Xintong came from 3-1 down to beat Barry Hawkins 5-4 and reach the semi-finals of the Evergrande China Championship in Guangzhou. Zhao, age 21, followed up yesterday’s victory over Mark Williams with an equally impressive win over Hawkins as he kept his best ever ranking event run going. On Saturday he’ll face world number one Mark Selby – a 5-2 winner over Yuan Sijun – for a place in Sunday’s final, where a top prize of £150,000 will be up for grabs. Hawkins made breaks of 69 and 52 in taking a 3-1 lead. After the interval world number 97 Zhao, ranked 90 places below his opponent, won a scrappy fifth frame then made an 86 in the next for 3-3. Hawkins regained the lead with an 85 but didn’t score a point in the last two frames as Zhao fired runs of 94 and 82. “I didn’t play well during the first half of the match,” said Zhao, who dropped off the pro tour last season but bounced straight back via Q School in May. “There were many spectators cheering me on which gave me pressure to perform. Towards the end I managed to adjust and I played as if I was in practice. I played my own game and left my opponent few chances in the last two frames. “I’ve always believed in my technique but I don’t think I have the ability to turn games around when they are not going well. Many of the young players get stuck at this point and are not able to improve. But luckily for me I have done it now. Selby reached the 40th ranking semi-final of his career with a comfortable 5-2 win over 18-year-old Yuan. The first four frames were shared then Leicester’s Selby seized control after the interval and took three in a row with 86, 64 and 70. He is looking to win his seventh ranking event in China and fifth within the past two years. 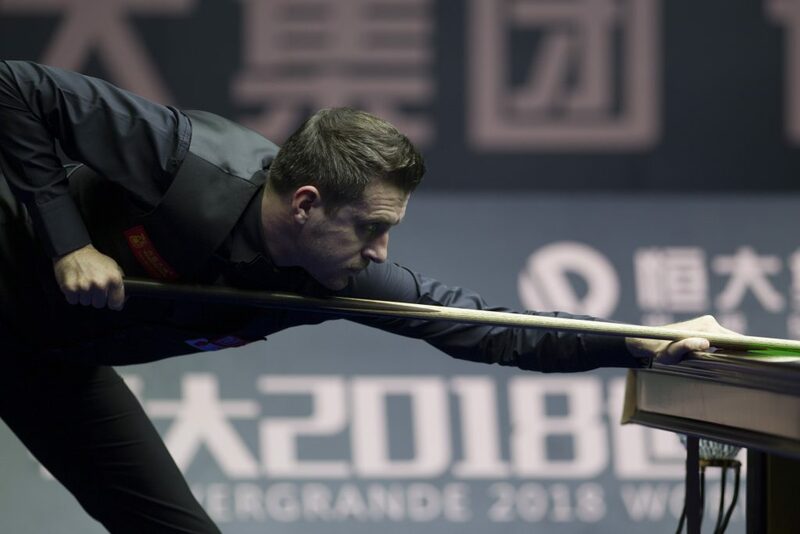 “From 2-2 I shut him out and scored when I needed to,” said 35-year-old Selby, who is sure to build his lead at the top of the world rankings following the exit of nearest challenger Mark Williams. “I feel as if I am close to playing really well, although the conditions are tough so you can’t play faultless snooker. Once again, I didn’t see that much of the snooker today, but here are my thoughts on what I did see. John Higgins, as himself stated, didn’t play well at all. He missed all sorts. But there are two aspects of his game that remained excellent: his tactical nous and his will to win. Those two were the keys to his victory. Judd Trump had only lost three frames coming into this match, but the truth is that he wasn’t challenged. Today John Higgins asked questions, in particular when he won frame 6 against all odds. And Judd, as so often had no answers. Some of the shots he took left me rather nonplussed. I’m not saying that he deliberately threw the match, because I don’t for an instant believe that he would do such a thing, but for sure, he became impatient, frustrated and ended up playing right in Higgins hands. Unless he manages to rein-in those emotions, I’m afraid that he will never achieve what his natural talent would allow him to achieve. It would be a shame. 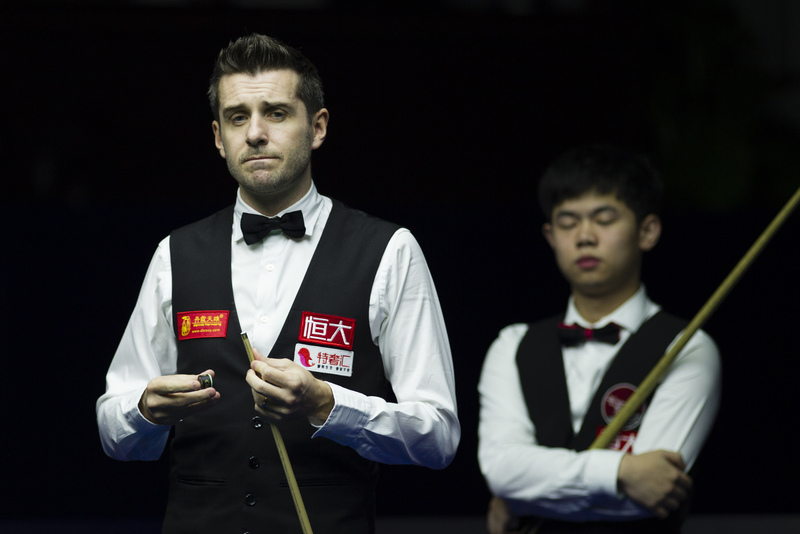 Mark Selby played rather well and Yuan SiJun, although he lost, made him work for his win. It was certainly a higher quality match than the Higgins-Trump one, albeit more one-sided. Mark will face Zhao Xintong, who I only was able to watch in the last frame of his match today. It was a decider and he was very solid. This should be a good match: hopefully both will be in good nick. It was a rather eventful day in Guangzhou as, quite extraordinarily, Zhao Xintong, 21 years old, came back from 3-1 down to beat the World Champion Mark Williams. Last season Zhao dropped out of the main tour but immediately re-qualified. He’s now in a QF for the first time. Another young Chinese, Lyu HaoTian is responsible for Shaun Murphy exit. Lyu is only 20. He too dropped out of the main tour a couple of years back. He was clearly too young and lost in a completely alien culture when he first turned pro, and he had a very hard time. So it’s nice to see him doing well. And finally, Yan Sijun, only 18, did beat the very experienced and tough Mark King, scoring four breaks over 50 in the process. To his question, I’m afraid that, the answer is no, when it comes to mainland Europe, at least in the near future. We simply don’t have the structures, nor do we have the infrastructure, to really develop our aspiring snooker players. And this is despite remarkable efforts from some snooker passionate in France, Belgium and Germany. But it’s largely individual efforts. Anyway… I’m glad to see young players coming through and I don’t care which nationality they are TBH. As for what I watched, which is not much, the Mark Selby v Hossein Vafaei was a close and good match and Mark Selby seems to be playing well and more positively. Zhao Xintong scored one of his career best results by beating World Champion Mark Williams 5-3 to reach the quarter-finals of the Evergrande China Championship. Zhao, 21, is the oldest of three Chinese players through to the last eight of the tournament in Guangzhou, alongside 20-year-old Lyu Haotian and 18-year-old Yuan Sijun. Last season, Zhao was relegated from the pro tour after a string of defeats, but he bounced straight back via Q School, and is now living up to his potential with an excellent start to the 2018/19 campaign. He is through to the quarter-finals of a ranking event for the first time and will now face Barry Hawkins. 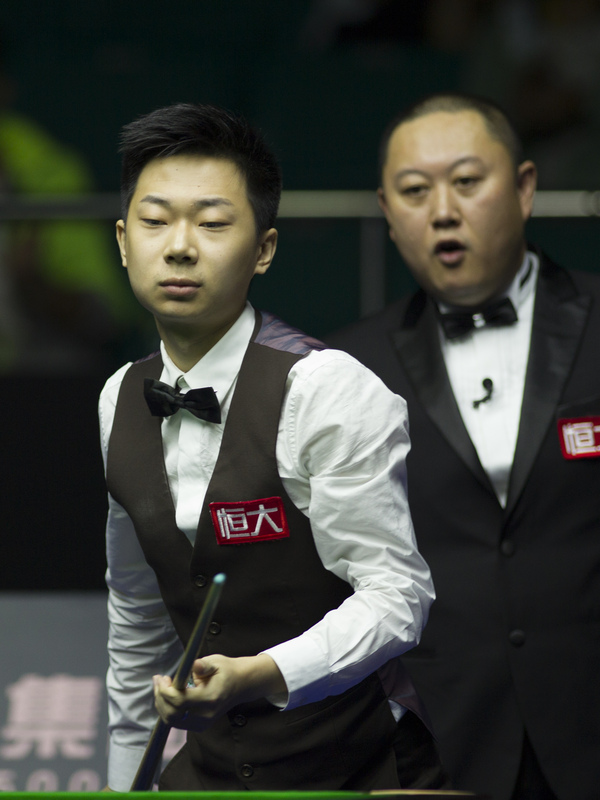 Williams made a break of 108 to lead 3-1, but Zhao took control after the interval and won four frames in a row with top breaks of 52, 94 and 74. “I played well, especially in the second half of the match,” said world number 97 Zhao. “I was playing with a very good attitude. I didn’t play well last season but now I’m playing with good confidence. There are a lot of Chinese players from the young generations coming though now which is brilliant. Lyu scored a 5-3 win over Shaun Murphy with a top break of 75 while Yuan saw off Mark King 5-3 with runs of 82, 76, 56 and 66. Yuan, who had never previously been beyond the last 32 of a ranking event, said: “I took my chances better than my opponent and I had the advantage throughout the game. I have put in a lot of work since the World Championship because I want to make sure I stay on the tour at the end of the season. It seems like that has paid off. Judd Trump has lost just three frames in his three matches so far. 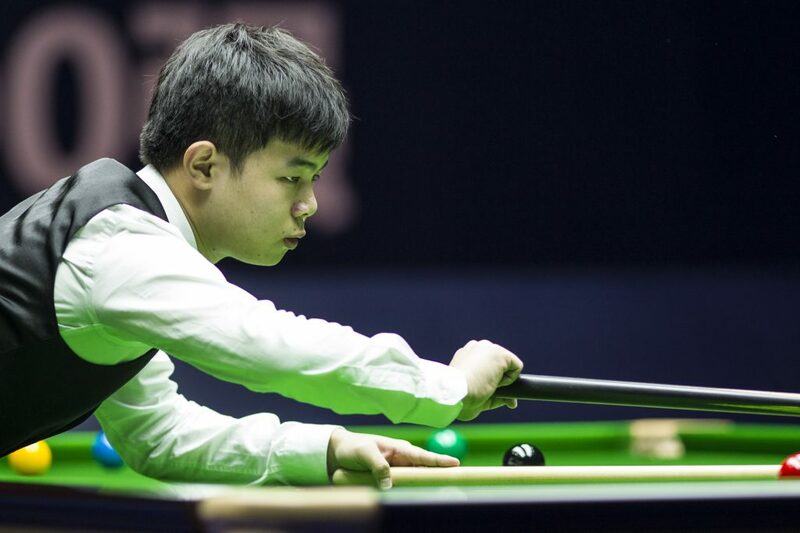 He swept aside Yan Bingtao 5-1 today with breaks of 53, 81, 111, 56 and 55. Trump now meets John Higgins in a mouth-watering clash – a repeat of their World Championship quarter-final earlier this year which Higgins edged 13-12. World number one Mark Selby scored a 5-3 win over Hossein Vafaei, pulling away from 3-3 to take the last two frames with a top run of 108. Hawkins beat Graeme Dott 5-2 with a top break of 79. Martin O’Donnell scored a 5-2 win over Liang Wenbo with a top run of 62. O’Donnell’s only previous appearance in a ranking quarter-final came at the Shoot Out earlier this year when he got to the semis. And, not snooker related, Ronnie will feature in the Fifth Gear show tonight and this is the rather amusing short trailer. Today saw the last 32 round played to a completion and there were a few surprise results with defeats from Joe Perry, Mark Allen, Stuart Bingham, Ryan Day, Neil Robertson and Ding Junhui. John Higgins was pushed to a decider by Mei Xiwen and it’s only experience that got him through. This means that we now have five Chinese players in the last 16: Liang Wenbo, Yan Bingtao (who beat Bingham), Yuan Sijun (who beat Ding), Lyu HaoTian (who beat Perry) and Zhao Xintong (who beat the very tough Fergal O’Brien). The last four on this list are 21 years old or younger. The “veteran” Liang Wenbo is only 31. We have another young Asian player in the draw in Hossein Vafaei, the 24 years old Iranian, who beat Ryan Day. Facing them, we have nine UK players and one Australian, with only two, Scott Donaldson, 24 years old, and Judd Trump, 29 years old, under the thirty threshold, and actually six of them above 35. Recently both Ronnie and Hendry have expressed concerns about the future of the game in the UK and Europe and I can see where they come from. For many years now there have been predictions that the Chinese might take over the game, and this was laughed at by many, but, by the looks of it, it’s coming. I couldn’t watch much, but for what I saw, Shaun Murphy played decently but not at his best, John Higgins was unconvincing despite the win and Mark Selby markedly improved from his previous match. There is another aspect as well. The Q-school is held in UK only, the qualifiers are held in UK even for the Chinese events and because of those two factors both the top-up system and the challenge tour mainly benefit UK/Irish amateurs who gets the opportunity to hone their skills against top opposition. China injects a lot of money in the game, and CBSA wants similar opportunities for their young players. Until Chinese events are played from last 128 in China and the promised Asian Q-school is reality they will continue to insist on wildcard, and IMO rightly so. The bias in favour of UK players is a reality. Ding Junhui suffered a shock 5-4 defeat against 18-year-old Yuan Sijun in the last 32 of the Evergrande China Championship in Guangzhou. 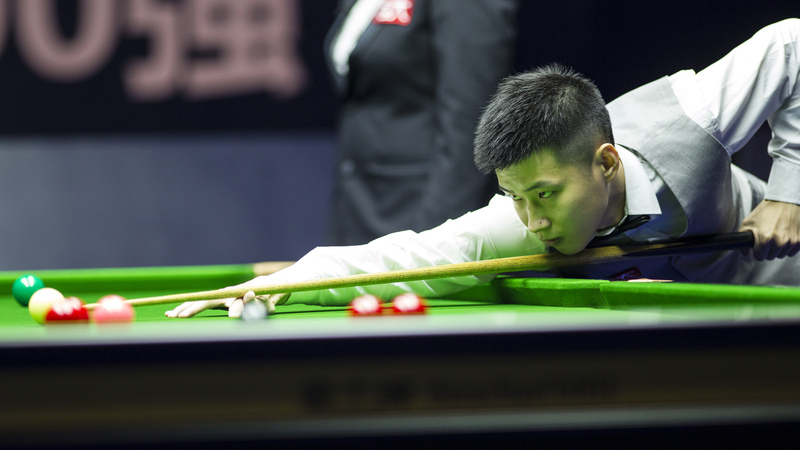 Yuan, who turned professional last year, took a dramatic deciding frame to score the best win of his career so far and reach the last 16 of a ranking event for the first time. He will now meet Mark King, who thrashed Masters champion Mark Allen 5-1. After sharing the first six frames, Yuan took the seventh with a superb break of 108. He could have sealed the match in the eighth, but missed a red when leading 66-6. China’s top player Ding, winner of 13 ranking titles, fought back and got the snooker he needed to take the frame to the final black. After a safety exchange, Yuan went in-off the black to leave the score at 4-4. Yuan made 55 in the decider before missing a tricky red, and Ding had a chance to clear, making 40 before leaving the final red in a the jaws of a baulk corner. That proved crucial as Yuan added the points he needed for victory. John Higgins came from 4-2 down to beat Mei Xiwen 5-4. China’s Mei had chances to win the match but couldn’t take them and four-time World Champion Higgins took the last three frames with a top run of 85. Donaldson came from 3-2 down to beat Jack Lisowski 5-3 with a top run of 105. World Champion Mark Williams continued his fine start to the season as he beat Gary Wilson 5-2 with a top break of 136. World number one Mark Selby scored a 5-1 win over Chinese wild card Chang Bingyu. A break of 60 gave promising 16-year-old Chang the opening frame, but Selby then took control, winning five frames in a row with runs of 66, 62, 64, 88 and 59. Judd Trump saw off Jamie Jones 5-2 with a top break of 64, while Shaun Murphy compiled runs of 108 and 92 in a 5-2 defeat of Xiao Guodong. China’s Yan Bingtao made a 111 in a 5-2 win over Stuart Bingham while Iran’s Hossein Vafaei top scored with 93 in a 5-3 win over Ryan Day. After two days in Guangzhou, we are only at the last 32 stage and two of the guys on the poster are already out of it: Marco Fu and the defending champion Luca Brecel. Only one wildcard, Chang Bingyu is still in the draw, having beaten Jimmy Robertson in the last 128 and Robert Milkins in the last 64. He will face Mark Selby tomorrow. 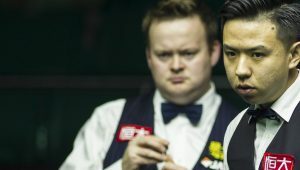 Among the high-profile players, other than Marco Fu and Luca Brecel, we have seen defeats for Ali Carter, Stephen Maguire, Anthony Mc Gill, David Gilbert and Michael White. None of those defeats happened on a television table. Mark Williams, the World Champion was on a side table today and came up with on twitter. Well pleased to get through that game,conditions very poor and water leaking on table so had to switch tables and done me a favour, Sams a class act and will be a major player soon. I’m not saying that those players would have won on the main tables, but this is a professional event and conditions should be such that those pros can truly show the full extend of their skills. Also, Luca Brecel was the defending champion, the first ever player from mainland Europe to win a ranking title and what happened? He was made to play yesterday, on the television table all right, but a 3:30 am CET and only available on the ES player, then on an outside table today. If really snooker is to be developed in mainland Europe and young people to be inspired to play snooker, this isn’t the best way to achieve it. Yesterday I didn’t have much time to watch snooker. From what I saw, John Higgins wasn’t playing great: in fact he played very well in patches, and awful in patches as well. He did enough but it was a bit bizarre. Mark Williams outplayed Rod Lawler, and looked like he was losing his concentration at times, but Rod was unable to take advantage. Watching Rod out there made me sad: he looked very down on himself. This is a man who loves the game and he’s facing the end of his career. I hope that he can find a new lease of life on the World Seniors Tour when the time comes. Today I was able to watch a bit more. To say that the Selby v Akani match was a hard slog is an understatement. Neither player was flowing. Mark Selby is probably low on confidence, he’s not got the best last 15 months on the baize. Maybe that’s why he was rather defensive and even negative in his game today. Several times he refused pots that I really expected him to take, and his long potting was dire. He still won eventually but it wasn’t pretty. Judd completely outplayed Rhys Clark. Rhys though had opportunities, at least in the first three frames. Rhys hasn’t won a match yet this season, he’s won only one match all last season. This was a total mismatch and nobody really likes or wants to see this. The other matches on television featured Ding Junhui playing Daniel Wells, and Shaun Murphy playing Liam Highfield. Both matches ended on a 5-1 score. I know that Ding will always be on the television table in China, but… maybe there should be a rethink about who is on television taking into account the expected “competitiveness” of the matches. 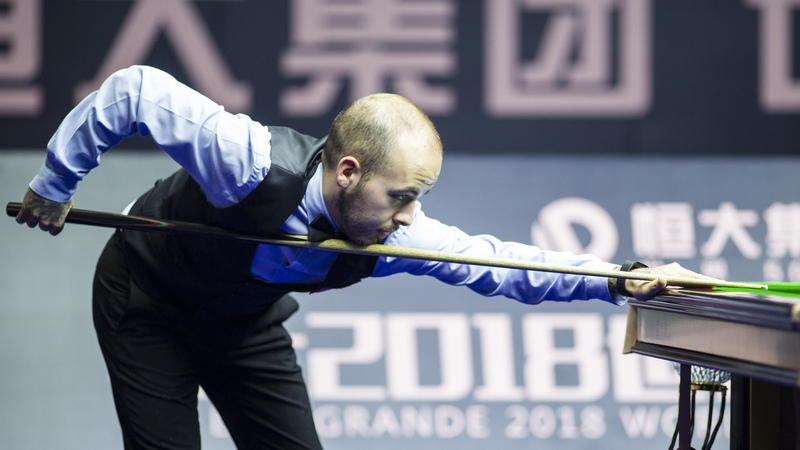 Luca Brecel began the defence of his Evergrande China Championship title with a 5-1 defeat of tour rookie Joe O’Connor. The Belgian picked up ranking silverware for the first time in his career last year in Guangzhou, thanks to a stunning 10-5 win over Shaun Murphy in the final. However, Brecel’s season ended on a low point after suffering a first round exit at the World Championship against Ricky Walden. Following today’s game he admitted that defeat spurred him on to make a lifestyle change to help him on the table. World Champion Mark Williams swept aside Rod Lawler 5-0 to book a clash against Ken Doherty, the man he defeated in the 2003 world final, in the next round. The Welshman compiled breaks of 56, 64 and 102 on his way to a comfortable victory. China’s number one Ding Junhui battled past a determined Lee Walker to come through a 5-3 winner. He clinched victory with a break of 68 in the eighth frame. Scotland’s Four-time Crucible king John Higgins was made to work for his 5-3 victory against Allan Taylor, as he battled back from a 2-0 deficit. Higgins’ compatriots Scott Donaldson and Stephen Maguire battled it out in their last 64 clash, with world number 54 Donaldson recording a surprise 5-2 win. Fergal O’Brien put on a fine display to emphatically defeat four-time ranking event winner Ali Carter 5-1. The Irishman composed runs of 88, 121 and 71 on his way to the win. It was a disappointing defeat for Carter, but his solitary frame did come in spectacular fashion. He fired in a 144, the highest break of the tournament so far. 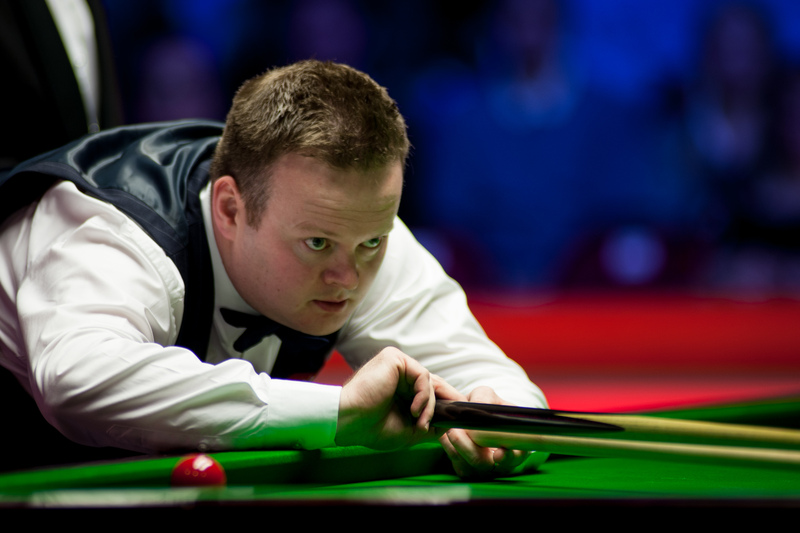 Shaun Murphy eased through his opening match at the Evergrande China Championship, defeating Liam Highfield 5-1 in Guangzhou. The 2005 World Champion, who was runner-up at last year’s China Championship, looked to be in good touch this evening as he wrapped up the victory in just over an hour and a half. However, Murphy had previously been struggling to find his best this campaign. 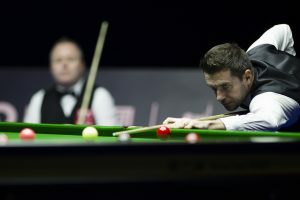 The Magician suffered qualifying round exits at the Yushan World Open and the European Masters and a first round defeat at the Paul Hunter Classic. Those losses came amid plenty of changes off the table for Murphy, who has become a father for the second time after his wife Elaine gave birth to a girl named Molly. Their family have also recently moved to Dublin. After reaching five finals last season and winning one title, at the Champion of Champions, he now hopes this can be the moment he can kick on in 2018/19. Ding Junhui produced a fine display to see off the challenge of Daniel Wells in a 5-1 victory. The Asian number one fired in breaks of 89, 125, 79 and 53 on his way to the win. World Champion Mark Williams went one better than Murphy and Ding, securing a 5-0 whitewash of the man he beat in the 2003 Crucible final, Ken Doherty. 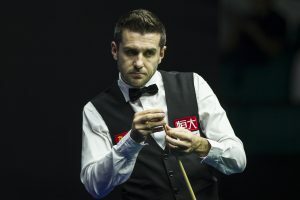 World number one Mark Selby came through a gruelling three hour and 40 minutes clash with Thailand’s Sunny Akani 5-3. Judd Trump put on a blistering performance to defeat Scotland’s Rhys Clark 5-0 in under an hour. While Martin O’Donnell secured one of the biggest wins of his career to send defending champion Luca Brecel crashing out by a 5-3 scoreline. The China Championship 2018 starts tomorrow. And today, as usual in Asia, it’s red carpet ceremony in Guangzhou. Only two top 16 players are missing it: Ronnie who didn’t enter and Kyren Wilson who withdrew. Kyren came on social media to explain the reasons for his withdrawal. His young son Finley was taken in medical care, very unwell, a few days ago and although he is getting much better, Kyren feels that his family needs him more right now than the fans in China do. I’m sure that this is the right decision and that the Chinese fans will se much more of him in the coming years. It’s fair to say that Marco Fu’s two little girls are stealing the show there!